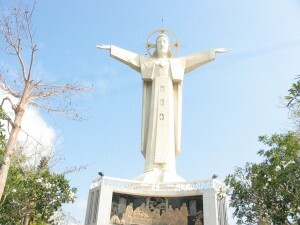 People’s Committee of Ba Ria, Vung Tau Province, Vietnam has made the largest statue of Jesus Christ on the mountain ‘Tao Phung’, Vietnam between 1974 and 1994. The statue is placed on a pedestal, measuring 32 m high and length of the arms is 18.4 m. Inside the statue, there is a spiral staircase with 133 stairs. Comments for Largest statue of Christ are now closed.